As many of you may have gathered by now, I absolutely adore answering tags, be they here in written form or over on my (very sporadically) updated YouTube channel. I like to keep things interesting and don't post tags here all that often, but aim for at least a couple a year. Sometimes folks will kindly tap me to answer specific tags that they're playing along with, at others I'll discover them independently myself and feel a desire to answer the questions they pose. Though occasionally tags (such as 100 Questions to Inspire Rapid Self-Discovery) get in-depth and personal, most are just plain fun. As well, I find them to be an excellent partner for the weekend, when few of us have the time or burning desire to delve into lengthy and/or heavy posts. Today, on the very first Friday of my absolute favourite season of the whole year, I though I'd take a stab at answering the I ♥ Fall Tag, which has been floating around the web in various iterations for at least four years, if not longer. This tag is speedy, easy, and totally enjoyable - so I highly encourage all those for whom it also resonates with to play along as well (please be sure to leave a comment with a link to your own post or video, if you do, so that I can delight in reading/hearing your replies, too). 1. Favourite fall lip product? My trusty tube of MAC Diva lipstick. It's the perfect vampy, blackberry juice hued colour to compliment so many of autumn's muted and jewel toned ensembles (not to mention, all things black and mysterious looking, too!). 2. Favourite fall nail polish? There are sooo many that I love! Narrowing it down to a single choice is not easy, but if I must pick just one, I'll have to go with the wildly beloved modern day classic, Lincoln Park After Dark from OPI (which, perhaps not all that surprisingly or coincidentally, is quite similar in hue to my lipstick choice above). 3. Favourite time of the day during fall? It's a two-way tie for me between the (truly!) golden hour and dusk, when the heavens takes on the inky, marbled look of the illustrated skies in that most awesome of Halloween classics, It's the Great Pumpkin, Charlie Brown. 4. Favourite fall candle? Back in 2014, when Target still existed in Canada, Tony and I picked up one of their Limited Edition brand Pumpkin Cheesecake candles that is so incredibly delicious scented, we not only haven't actually lit it yet, but we keep it out on a tiny shelf in our kitchen - where it gently perfumes the air - all year long. That one takes the (cheese)cake for me in this camp. 5. Favourite fall accessory? 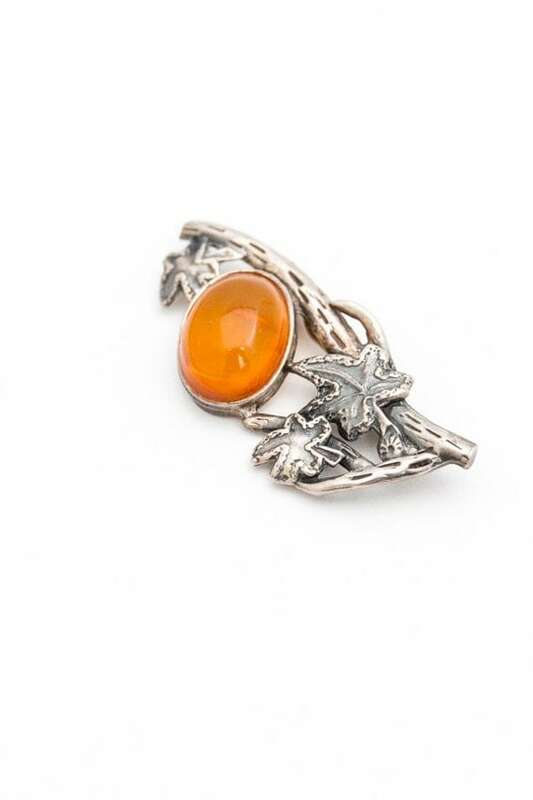 Any sort of vintage or vintage inspired autumn jewelry, especially if it stars maple leaves and/or pumpkins (such as this elegant antique amber and sterling silver brooch that is available in my Etsy shop). 6. Haunted house or fun fall hayride? Both, pretty please! But, if I could only pick one, haunted house all the way! I love experiencing safe thrills and chills comes October. 8. Favourite sweet treat to eat come Halloween night? Definitely handmade caramel apples, which I whip up a big batch for each All Hallows Eve (because, as we all know, calories don't count on October 31st! ;D). 9. Have you picked your Halloween costume for this year yet? I have indeed, but I'm not telling anyone (but my darling husband) what it is! :) I always save my reveal until the big night it itself and even like to surprise my parents with my costume choice. Edit: When I penned this post recently, I thought I'd hit on my costume for this year, but now, I'm not as sure and am quite 50/50 between two (one of which I wore in a past year, but didn't share here yet). No matter what I go with, I'll be posting about it in November. 10. What is your favourite thing about fall? Everything!!! In particular though, I adore how the season exquisitely marries light and dark in so many different ways, the stunning fall leaves, autumnal foods, and the various elements that I highlighted here back in a 2014 post called 5 things about Halloween That Make Me Disproportionately Happy. There are scarcely words enough in the languages of the world to even come close to adequately describing my elation over fall's return. While I will miss summer's powerful heat (and generally very outdoor photo shoot conducive weather), this season is so entwined in my soul that I always forgive it instantly for sending its predecessor packing. From the fact that autumn has always felt like the true new year for me (as touched on previously in posts such as this one) to the sublime colours that Mother Nature drapes herself in to my most beloved of holidays, Halloween to, yes, really and truly, pumpkin spice everything, no other time of the year makes me quite as content, gleeful as autumn does. Naturally, this leads me to want to "blog (and wear) all the fall things", so you can bank on a fun bevy of seasonal posts here as each week and month of this fall progresses. Such will include scrumptious harvest fare, All Hallows Eve themed entries, cold weather styling ideas, and plenty of vintage and handmade autumn perfect finds. In fact, you could say that season is going to be as rich in fall related posts as a mug of warm apple cider is in gorgeous spiced aroma! Here's to a brilliant, beautiful, and exciting (not to mention, playfully spooky) autumn for all of us! *PS* Have you heard? There's two times the giveaway fun going on right now! Here on Chronically Vintage, I've teamed up with Wise Apple Vintage this week to offer one lucky winner the chance to take home a $75.00 USD store credit to their awesome online vintage decor and collectibles shop. Enter that giveaway on this post. And over the blog of my lovely friends the Boyer Sisters, I myself am giving away a $75.00 store credit for my Etsy vintage shop, as well as offering a limited time coupon code there for 25% off on everything in my store between September 21st and October 10th. Pop on over to their blog for your chance enter and to avail of this deep discount when you shop Chronically Vintage on Etsy. Happy Autumn!! This is the best time of the year...the beautiful scenery, scents and comfy clothes! Halloween is hands down my favorite holiday. Every season has its beauty and special qualities but fall is magical. Thank you very much, my sweet friend. Joyful autumn wishes to you as well! I completely agree. There's just something magnetic in the air during the fall that pulls in to this season like no other. Yay, Fall! I love its changes in nature. I've done "Fall foliage runs" which are motorcycle trips up North to see the beautiful leaves changing color. Tomorrow, I'm thinking of visiting my favorite place, Longwood Gardens, for its display of autumn flowers. That sounds like a truly marvelous experience, Ally. I always, always make a point to look at photos online of the amazing fall hues on the Eastern side of the continent. The reds in particular, which aren't very common with the fall foliage here in the Okanagan, always take my breath away. I sincerely hope to make it out to that part of the world one fall myself to experience the gloriousness of the changing, tumbling leaves first hand. I hope you have a terrific ride, if you head up to Longwood Garden today. I am going to struggle to fit into a Halloween costume this year. I love how much you love fall. Do you mind if I try this tag challenge? Go for it, my dear, that would be awesome. I look forward to reading your answers and learning more about your own passion for fall. How lovely about that jacket. Shopping one's own closet, so to speak, and rediscovering great pieces is something I adore doing as well. I picked up a new mid-century winter coat last winter myself (while in Vancouver) and can hardly wait to share it here when the temps really start to plummet. Thank you very much for your splendidly nice comment. I hope that you're having a terrific weekend! Thank you sweetly, dear Lorena. I really am in a fabulous mood now thanks to autumn's return and all of the special things that will be happening in the next few weeks. On top of Halloween, there's Canadian Thanksgiving, numerous family birthdays (including my little sister's), and mine and Tony's wedding anniversary. It's always a busy, fabulous month and I can hardly wait to hop into it again. I hope that it's a fantastic one for you as well, sweet lady. oh, I am looking forward to fall. The pumpkin cheesecake candle sounds really wonderful, (being another cheesecake fan). Happy fall time! I love fall too- there is just something so crisp and beautiful about this season- I only wish that it lasted a little bit longer! I also love autumn, for so many reasons! I haven't painted my nails in awhile, but I should paint them orange and black for the upcoming Halloween season, and put my orange and black plaid tablecloth with black lace back on the table. I also had a lot of fun recently collecting a bunch of new (so to speak) vintage Halloween postcards and pictures, for use in my Sunday blog posts this October, and the grand super-long post on Halloween itself. For the other days of the week, I'll be discussing classic horror films with landmark anniversaries this year, like Dracula and Faust. Definitely! I love that colour combo (as well as bright green and true orange, and bright green and purple) for fall, too. Let's both aim for a mani in that palette next month. It's wonderful that you're a huge fan of autumn as well. That's another great point that we share in common, my dear. I sincerely look forward to seeing your vintage Halloween ephemera filled posts and all seasonal ones you have in the works for us. what will your wear on halloween - can´t wait to see the pics of you!!!!! still no halloween here - but lots of walks in the wood, collecting mushrooms, celebrating autumn with hearty meals and red wine together with friends........ while wearing lots of tweed! that first image with the gloved hands is pure art!! love it! Hi sweet Beate, I haven't found (or made) my costume for this year yet and am still batting a few different ideas around yet. Definitely time to select something though, as there's just five weeks to go until the big day. I'll be posting here (and on social media) about what I/we wear for it at the start of November. I look forward to that post every year now, too. It's become such a fun tradition (especially since Tony started dressing up for Halloween a few years ago). That's great! It really is an incredible, invigorating, beautiful point in the year. I hope that you guys have a stellar season! I love, love, love autumn! I love the evenings drawing in to a ridiculous level, so much that the weather app on my phone gives sunset and sunrise times and I gleefully skip ahead the days to watch the times get earlier for sunset. I love the smell of autumn and emerging from shops into the dark as much as leaving air conditioned shops onto the warm streets of summer. I have a whole month of Halloween themed posts planned for October! That sounds so very beautiful, dear Melanie. I utterly adore autumn sunsets and dusks as well. They can be hypnotically stunning and are often the last (or nearly so) truly vibrant ones we get until spring returns. Your own passion for autumn is palpable. Love that to bits and can't wait to continue celebrating this breathtaking season with you. Loved this tag, dear Jessica! I loved the color of the MAC lipstick and also the OPI nail polish and you are right, both look pretty similar! I also love dusk, it's so ethereal, I like it! Haunted house, cool :) Well, I am kind of an "interior's decorating freak", so I look at the photo you posted and immediately started with the renovation in my head :) hahaha! I am so curious to know about your Halloween costume, but OK, I can wait some weeks more :) Hope you have a very beautiful weekend, hugs and regards! Isn't it though - dusk during the fall is very invigorating and exciting for me. It's almost as though you can see and hear festive spirits in the wind that blows the day's sunlight away. Summer has been a close second for me for a number of years now, but nothing tops fall in my books. The colours, the brisk winds, the seasonal decor, the scrumptious harvest, the Halloween fun, it's all so exciting and beautiful. It's awesome that you go weak in the knees for autumn as well, dear Ann. I love that such is another point that we share in common (we really are cut from the same cloth on so many fronts). The trees are starting to turn here and they're just gorgeous! We'll definitely be aiming to get some photos shoots with seasonal hues and leaves in the background. I hope that you're having a fantastic, sunny first weekend of fall. What a fun tag post! I do adore a lot of the things you wrote about here including 'Hocus Pocus' which is a pretty fun Halloween flick. I haven't really experienced the whole gold and brown leaves fall before as the place I live is pretty tropical and doesn't really change in temperature that much during the year. Thanks for your lovely comment, my dear. I hope that you're able to spend fall (or spring south of the equator) someplace with the iconic seasonal colours and crunchy leaves one day. You're always welcome here in Penticton, if you wanted to spend part of the fall in Canada. Oh, I need to try caramel apples one day! You definitely do, my dear. Both candy and caramel apples are mind blowingly awesome in my books. I couldn't imagine fall without indulging in this special treat. If you're looking for a quick cut spin on this classic sweet treat, a jar or tin of dulce de leche caramel and sliced or cubed apples (that you dip into it) is pretty amazing, too. Same here!!! Both of the 1990s Addams Family movies, plus Ghostbusters, is a must at our house come October. It's awesome that you're a huge fan of Hocus Pocus, too. Which of the characters is your favourite? That's awesome, sweet dear! Thank you very much for playing along. I so enjoyed reading your answers and discovering more about you, my fellow die hard Hocus Pocus fan. Wishing you an amazing autumn! How wonderful that go go wild for autumn as well. It really is a gloriously lovely (and far too short lived, IMO) chapter in the annual calendar of the seasons. I'm excited to see what you picked for Halloween's costume ! Haha! That is a shame indeed, sweet dear. I'm sorry that pumpkin scented candles aren't easy to come by in France. I know from my time living in Ireland, that many of the elements so integral to autumn (in recent decades at least) here in North America are hard, if not impossible, to find in much (or all) of Europe. Perhaps you could order some online? I know that a fair number of indie candle makers on Etsy ship abroad. I absolutely love fall too! The seasonal candles are one of my favorites, I just love lighting a couple of those in the evening and curling up with some knitting or a book :) And I always get in the mood to bake as the weather first starts to turn cooler. I LOVE Hocus Pocus! I've always wanted to dress as Sarah for Halloween, Hehe. That is a seriously awesome compliment, honey. I really mean it. I'm huge on living in sync with the seasons and celebrating the gifts and joys that each one has to offer, so knowing that I've helped you to appreciate them all the more is sincerely one of the most touching things anyone could ever say to me. Oh, if I had a blog I would answer these questions right away, but I don't. I have lately been thinking a lot about starting a new blog, I even have a name made up: Fifty in the Fifties, ha! I would only write it in English this time then, not to double the work as I did last time. But then I think again, I think I have forgotten the hard work and my damn dedication, so I don't think I will. Hi sweet Sanne, thank you very much for your terrific comment. I would love to read your answers to this post and my eyes lit up like fireworks when I read that you might be starting up a blog again. That would be incredible! It does take an immense about of time, work and effort though, as you know first hand, so I totally understand either way. What a great possible blog name!!! Love it! I wonder though, if you still had that blog when you entered the next decade of your life, would you wish that it wasn't tied to your (own) fifties? Just a friendly thought, of course. Perhaps something like "Fifties for Life" or "Fifties Forever" would sidestep that potential situation. Oh my word, I'm truly sorry that you've been dealing with so much this month and that your beautiful car was damaged by a reckless driver. My gosh, that must have been a terrible thing to deal with. It breaks my heart that you were injured in this accident (thank you very much for letting me know about it). You poor, poor thing. What a horrible experience to deal with. Reading about this accident made me cry (seriously) for you. Please, please take things as easy a possible. Rest, pamper yourself and try to to take things super easy. You will be in my thoughts and heart around the clock. I'm always here if you need someone to talk to about anything. I get that for sure, my dear. I've encountered tags before that had some questions that didn't really apply to me, so I skipped them (even though the I liked the general premise of said tag). It's sweet that you wanted to take part in this one, honey. There's so much to adore about fall. I don't think one tag could ever fully encompass all of it. What are some of your favourite elements of this season? Dear Jessica, What an interesting post! I love how the leaves change colors...some of the colors seem magical :) I look forward to my husband surprising me with a caramel or candied apple. Hot apple cider hits the spot when the temperature starts to drop. If anyone is interested, I read that Revlon Raisin Rage is a dupe for MAC Diva. That's a great tip regarding the lipstick, Dee. Thank you for sharing it! Wishing you both an outstandingly awesome October! Yes, it is such a shame we don't live nearby... but I really appreciate the thought of us getting together!!! Awesome idea :) Oh, we could eat chili with sweet bell peppers (orange & yellow for Autumn)!! Seriously, my husband thinks chili is ONLY a topping for hot dogs, french fries and not a meal. So, I make myself a batch of chili, divide it up in small portions and freeze it to eat alone. Wishing you & Tony a wonderful, busy October!! What a lovely idea, sweet lady. Isn't it interesting how some people view chili that way? It was a budget-friendly (my family was far from wealthy) staple at our house growing up, so I think of it as a mean first and a topping second, for sure. Thank you so much! I hope that you and your honey have a stellar, fun filled and very enjoyable October as well. I really hope that you are enjoying what Autumn has to offer so far. It has started in a lovely way here and I am enjoying the changing leaves and temperatures. My head is full of knitting and sewing plans and I can't wait to get on with them. How exciting that you've been thinking a lot about your cold weather knitting and sewing plans lately. I hope that everything goes swimmingly for you with any and all projects that you launch. It would be (super!) awesome to read your answers - and in those that are the same, we'd just discover even more that we have in common, my dear friend. I really look forward to your take on this fun tag, if you give it a spin.